Editors note, Oct 1, 2018: Please see Concerns about Roanhorse's Trail of Lightning, dated August 9, 2018. Books by Native writers have given me moments where a phrase so perfectly reflects my experience, that I exclaim aloud, with joy, 'YES!' Illustrations can do that, too, and once in a great while, a book cover will have that effect. 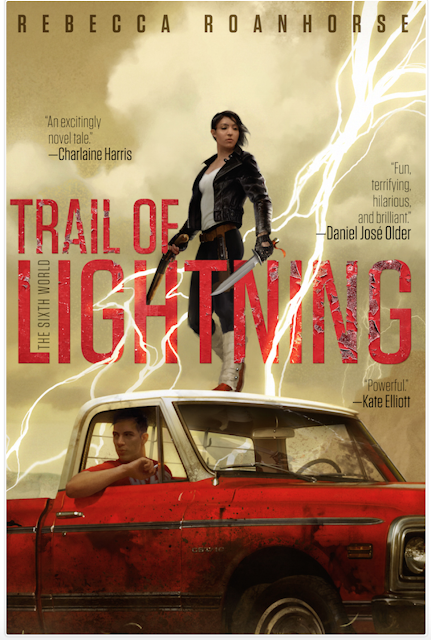 Last week, Barnes and Noble did the cover reveal for Rebecca Roanhorse's Trail of Lightning. Rebecca is Ohkay Owingeh (the tribal nation my mom is from) and African American. When I saw the cover, my heart swelled. I wanted everyone in my Native networks to see it! The art is by Tommy Arnold. Trail of Lightning isn't a book for kids but I have no doubt that they'll see teens and parents reading it. And feel empowered. Some of you may be wondering why we're having this reaction. We all probably see the power that the lightning imparts, but some of us saw Maggie's mocs. Some of us saw the truck we (or someone in our family) drives on the reservation. But there are things that are not there that make the cover powerful in other ways. Book covers that have Native women on them are usually books that are set in the past. They're written by people who aren't Native and profess to love Native people, but that ultimately don't understand the distinctions that exist amongst the hundreds of Native Nations in the U.S. and Canada. The default illustration of a Native woman, then, includes feathers, braids, fringed clothing, and a tipi, horse, and maybe a buffalo. All of that is possible for one nation--but certainly not for all of us. In other words, Maggie is so empowering to us because she's real. She is not a stereotype. The cover is exquisite because it speaks to us as people of the present day, and as readers who want to see our selves reflected on book covers. In 2019, Native children will be able to buy Rebecca's Race to the Sun. It will be published in the Rick Riordan Presents series. Its main character is a seventh grade Navajo girl named Nizhoni Begay. Trail of Lightning will be available on June 26, 2018. Pre-order it! It is being published by Saga Press, which is an imprint of Simon and Schuster. In the meantime, read the Q&A at Barnes and Noble, and follow Rebecca on Twitter. The phrase, "I can't wait" is a cliché that many of us on Native social media are uttering. It doesn't do justice, though, to the emotion this cover generates. I'll close with the word 'yes' -- in Tewa (my language). That feels right.